The museum store is located in the Herders Cottage. It features merchandise based on the history and culture of New York State and rural America. Handcrafted items produced by our highly skilled staff and local artisans are featured. A section containing toys, games, books and crafts will please children of all ages! Cross the street to the Fenimore Art Museum and visit The Fenimore Museum Shop. 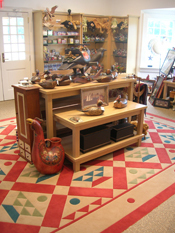 Located on the main level, the shop carries quality merchandise produced by regional artists, books and gifts related to art, New York State history, Native American art, jewelry, and folk art. May 7–October 14: Open daily, 10 a.m.–5 p.m.
November–December: Open for Christmas shopping. Stop by the Crossroads Café, located next to Bump Tavern in the Historic Village, for fresh homemade soups and chili, cold and hot drinks, fresh baked goods and ice cream. 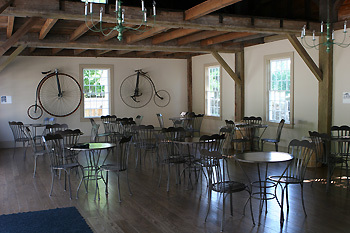 You can also walk directly across the street to the Fenimore Art Museum to the Fenimore Café. Dine al fresco on the garden terrace overlooking beautiful Otsego Lake, or select an intimate table inside. The changing menu includes homemade soups and sandwiches, espresso drinks, coffee, tea, an assortment of wines and locally brewed beers. The terrace features incredible plantings and a panoramic view of the lawn sweeping down to Otsego Lake. It is an experience not to be missed while visiting the Museum.